A beautiful home high up in the sky and a vibrant, colorful life is not a thing of dreams. Museum Tower Dallas is minutes away from local gourmet restaurants, lively nightspots, exciting sporting events, renowned department stores, active parks, exclusive shopping districts and, of course, amazing arts and entertainment. It’s the ideal location to feed your cultural appetite. Every week, Museum Tower hand-picks the finest in weekend entertainment #NearbyMuseumTower. From car-free outdoor fun to thought-provoking Asian art and everything in between, this weekend promises to be another of many great adventures. This evening, a special edition of Crow Collection After Dark brings a rare treat as the museum welcomes two incredible new exhibitions by Brooklyn-based artist, Jean Shin. Part of the inaugural Soluna International Music and Arts Festival, both Inclusions and Celadon Landscape pay homage to Shin’s Korean roots and are representative of her culture and heritage. The highly-anticipated site-specific sculpture, Celadon Landscape, references the shape of a Korean celadon vase and is constructed from ceramic discards collected from numerous kilns in South Korea. This particular project serves as a metaphor for the Korean diaspora while her other art is reflective of her unique experiences and identity as an Asian immigrant. Join the Crow Collection of Asian Art this evening for engaging artwork, the opportunity to meet artist Jean Shin, Korean dance and music, as well as other activities. Admission is free. 2:30 p.m. and 7:30 p.m.
Dallas Black Dance Theatre presents their Spring Celebration this Saturday at Wyly Theatre #NearbyMuseumTower. Closing the 38th season with both classic and contemporary works that push boundaries, this spectacular show is not be missed. In this series, the company premieres a new, striking aerial work by Jamal Story entitled, What to Say? 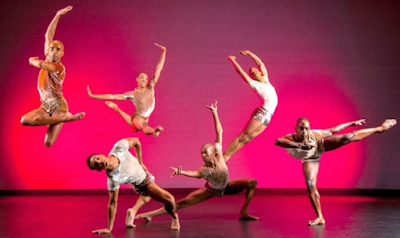 Sketches on Echo and Narcissus and a new commissioned world-premiere work by noted choreographer Daniel Catanach entitled, Surface, which focuses on the celebration, struggle and triumph of young men growing up in urban America. Spring Celebration also brings the return of Bridget L. Moore’s classic work Southern Recollections: For Romare Bearden. Seize this opportunity to experience the beauty of movement, part of SOLUNA Festival. ota, Colombia over 30 years ago, Ciclovías are now held in hundreds of cities worldwide. Dallas' second annual Ciclovía will be held #NearbyMuseumTower this Sunday, May 17, 2015! Together with the Metropolitan Dallas YMCA, Uptown will host a one-mile, car-free route to connect the Katy Trail to the Klyde Warren Park via Cedar Springs Road. Enjoy music, vendors and, of course, plenty of recreational activities including cycling, running, walking, yoga, Zumba and even rock-climbing. Museum Tower is a proud sponsor of this community event. Lace up those sneakers and get active this weekend!